One of the inevitabilities of Christian ministry is the Christian funeral. Many ministers find presiding over funerals to be both incredibly challenging and incredibly rewarding. However, with the ever pressing demand of Sunday services, the death of a saint does not often allow for thorough analysis of the meaning and purpose of a Christian funeral. Without theological reflection, the minister can easily be swept along into whatever practices are en vogue for the moment. Thomas Long, in his book Accompany Them with Singing (Westminster John Knox, 2009), seeks to fill what he sees as a void in current Christian thinking about funerals. For decades, Long argues, Christian funerals have lost the plot. Two key factors have led funerals astray. First, ministers (and others presiding at funerals) have too thoroughly bought into a therapeutic model for the Christian funeral. In this model, the funeral is meant for the living, to bring comfort for the grieving. The funeral is not truly about the deceased, or God for that matter. Second, Christian funerals have adopted dualistic language about the body and soul that underplays the embodied nature of the Christian life. We have disregarded the body of the deceased in both our words and our practice. By contrast, Long desires for the Christian funeral to recover its gospel character. The saint who has died is on the journey to God. We have gathered to witness their passage. The very notes that should sound at any presentation of the gospel (baptism, repentance, death, resurrection, forgiveness, adoption, etc.) should sound at the Christian funeral. These notes should sound with all the particularity of the context of the community and the deceased. The funeral will bring comfort, but Long argues this is a by-product of the gospel, not the purpose of the funeral itself. The funeral should be personal, but not personalized, which would ultimately obscure the gospel. The breadth of Long’s study of the Christian funeral serves as its greatest strength and its greatest weakness. Long serves to get much of the relevant material on the table for further discussion. For a single volume, Long manages to accomplish a lot. He frames issues well, but his desire to respect the contextual particularities of different regions means he leaves many questions open on which I would have preferred more clarity. Additionally, Long’s critique of platonic dualism in Christian funeral practice seems warranted, if a little heavy-handed at times (He even goes so far as to accuse N.T. Wright of Platonism). Overall, I found Accompany Them with Singing helpful in thinking about how I lead funerals. I enjoyed the way Long wove theology and history together in a way that helped give me a clearer picture of the present. 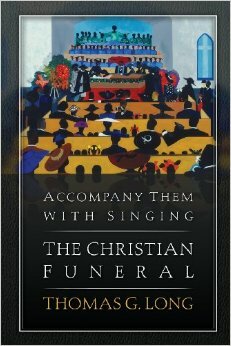 While not perfect, it is still a worthy introduction to the theology and practice of the Christian funeral.